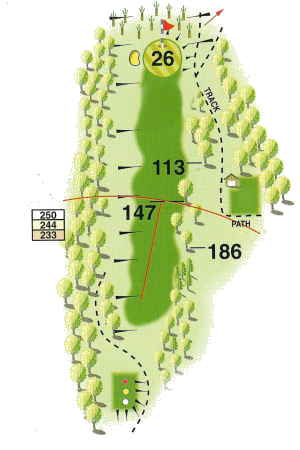 "This is a difficult hole, usually into the wind and will test your driving ability. The left to right sloping fairway will ensure that your ball will end up on the right. An accurate approach shot to the slightly elevated green should find your ball in the vicinity of the putting surface. Two bunkers on the left and deep rough on the right will make you want to do this, if short you are faced with a steep slope at the front with a confident chip and run needed."